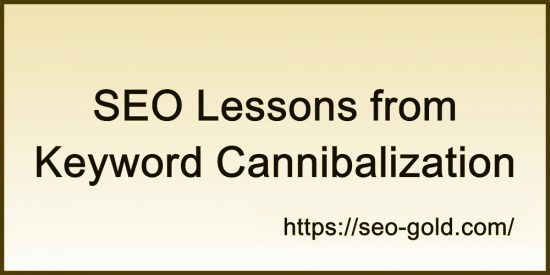 Keyword cannibalization is an SEO issue related to targeting multiple webpages to the same SERP wether by choice or inadvertently (by mistake). In it’s simplest form if we were targeting a SERP like “SEO Training” and believed multiple webpages targeting this exact phrase will result in the ‘best’ results (an incorrect belief). You might create say 5 webpages with identical title tags (all title tags are “SEO Training”) and each webpage would have relevant unique content. I won’t go into why this is a bad SEO strategy, just believe me it’s a waste of SEO resources and time, so don’t deliberately do this. The keyword cannibalization SEO concept is Google will be confused and won’t know which of the 5 webpages in our example above to rank the highest for the SEO Training SERP. There’s a major flaw with this SEO concept, Google’s algorithm isn’t THAT dumb. Google relies on hundreds of ranking factors and though title tags are a major ranking factor, it’s not the ONLY ranking factor. In our 5 webpage example, Google would look at the title tags AND the hundreds of other factors including usage in content, usage in backlinks etc… and rank the webpages accordingly. Basically one of the webpage will do better than the other four, or put another way you’ve wasted your time and SEO resources creating five webpages, building backlinks etc… when one page was enough. For the record it’s never a good idea to have multiple webpages with identical title tags, Google even warns of this issue under your Google Search Console (Google Webmaster Tools) account. Don’t do that. That being said, it’s quite easy to inadvertently keyword cannibalize important SERPs and lessons can be discovered from these SEO mistakes. A more realistic example of accidental keyword cannibalization is were we have multiple webpages around a niche and they all use a SERP as part of the title tags etc…. On this site I’ve been creating multiple public SEO tests, but so far don’t have a specific article targeting the “SEO Tests” SERP: I don’t have a webpage specifically targeting the “SEO Tests” SERP. All three title tags include the keywords SEO and Tests or Test. They all have the potential to rank in Google for the SEO Tests SERP. Which of these three webpages should Google rank highest for the SEO Tests SERP? The first two use the exact phrase SEO Test, but the third is SEO Performance Tests, which is the best match for SEO Tests? We can’t say just from looking at the title tags, Google will look at the entire content, backlinks power, anchor text etc… Since I know what’s on each of those webpages I’d make an educated guess it would be one of the first two links, but it’s not guaranteed. To confuse things further I want WordPress image attachment pages on this site to be indexed/ranked by Google (I also use them as easy content to Tweet about as well: see image below with the “Tweet Image” link) and have SEO Test relevant attachment webpages like the ones below. They are all related to images added to the first three links. Of these just looking at title tags the Public SEO Tests title tag would be a good contender for the SEO Tests SERP, BUT the link is to an image attachment webpage (deep content) and at the time of writing it only had one internal backlink vs the three SEO articles having dozens of internal links including from the home page. 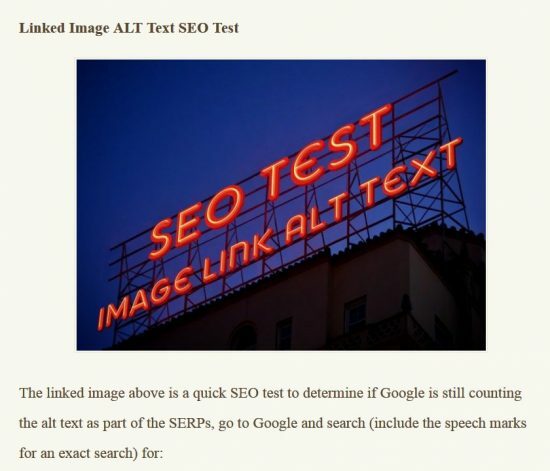 The SEO test articles are far more likely to generate natural backlinks than an image attachment page with one image and a small bit of content. We also have this webpage, which though the title tag doesn’t include Test(s), it does include SEO and there’s a LOT of content related to SEO Test(s) (the above links anchor text in particular). This webpage has the potential to rank for the SEO Tests SERP as well. A solution to the above is create a new article with a title tag including “SEO Tests” and target the majority of the content at that phrase. When I create more public tests I’ll create that article. As you can see it really is easy to sort of target a SERP on multiple webpages when creating content in a niche. Google has no problem with this sort of content setup, Google will index and rank it all accordingly based on the hundreds of SEO factors Google uses. Some of the above webpages might never rank for any phrases which generate traffic, others might gain traffic from dozens or even hundreds of different phrases (AKA: keyword spread). Therefore, keyword cannibalization isn’t really a real SEO issue, but when it happens it can be useful. You may have noted so far I haven’t discussed SEO lessons we can learn from keyword cannibalization. If you’ve ever spent countless hours crafting a piece of content and building backlinks to target a specific phrase on a specific webpage only to find another webpage ranks it’s an opportunity to learn. The fact what you thought would generate a SERP didn’t work indicates you don’t fully understand how Google works. You can glean valuable insights from these outcomes. I have a good example from a SERP that’s really easy and resulted in a result I wasn’t expecting until I thought about it: makes sense now (see below). The second URL format is generated for all WordPress Posts with at least one comment, more comments there are, more extra comment URLs generated. My WordPress SEO theme can take advantage of these extra URLs, BUT it takes some additional SEO work and for this Languagenut review I forgot to do it :-). Had I done the above when I first wrote the review Google would have probably considered the main article as the best webpage to rank (title tags are very important) rather than the “/languagenut-review/comment-page-1/” webpage. As I’m writing this SEO article I’ve modified the relevant SEO theme options to fix my SEO mistake, see screenshot below. When Google indexes the review again, it should modify the SERPs accordingly. 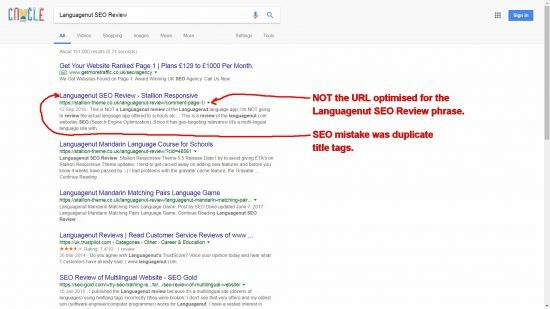 Another solution would be to add a canonical URL from all the “…/languagenut-review/comment-page-#/” URLs to “…/languagenut-review/” and Google should pass any SERPs to the main article. This is default WordPress behavior, but I’m not aware of any other WordPress SEO themes which have an option to set different title tags for comment pages, so this is pretty much the only other WordPress ‘fix’. I add the specific title tags for comment pages to gain more SERPs from user comments: the comments themselves are also indexed/ranked by Google in their own right as well: I try to take FULL advantage of ALL content on a site. 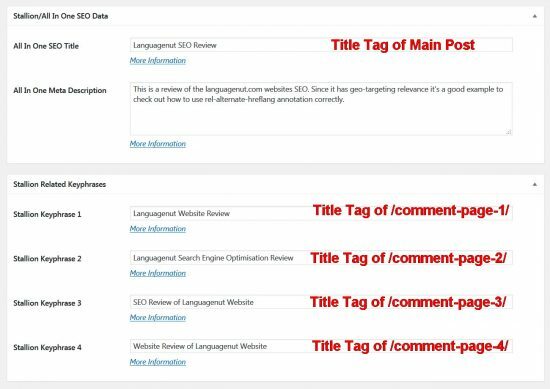 There’s lessons to learn from my duplicate title tags SEO mistake. The original article is almost 5,000 words long (it’s a big one), includes 18 images and the 6 comments (which include 6 more images) at the bottom: it’s a BIG webpage. The comment page version “…/languagenut-review/comment-page-1/” is much shorter, it’s the excerpt of the main article (120 words) with all the main images, HTML stripped out and a “Continue Reading Languagenut SEO Review” link below the excerpt back to the main article. It also includes the 6 comments (with the 6 images). Consider what’s the same/different between these two webpages. Main article has more link benefit flowing through it (has more links to it). The main article is big, covers much more than an SEO review, it’s a website review, covers social media marketing issues, branding issues etc.. this content could be easily split over several articles. The comment page is just the first 120 words, since I’m very experienced in SEO copyrighting I take extra time to optimize the first paragraph or two. 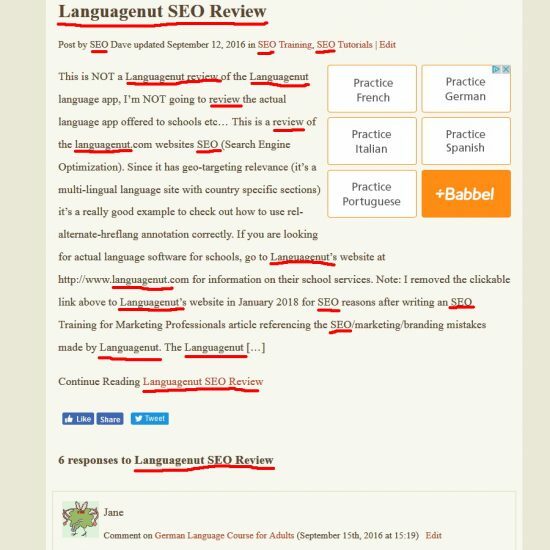 See the screenshot below, the content uses the words Languagenut, SEO and Review a lot. What appears to have occurred is the 120 word snippet of content is better optimized for the Languagenut SEO Review SERP vs the main article and this has trumped the small number of extra backlinks the main article has. Don’t take from this to ONLY create really short webpages (120 words would be short), both webpages include the 6 comments (inc. images) and the comments are not that short, add the 120 word excerpt AND the comments content together and we have a lot of content on comment page. Google considers the entire webpages content when ranking, not just the content WE think is important. Also consider keyword spread, webpages with a lot of content have the potential for ranking for thousands of phrases (keyword spread). IF the SEO review webpage had a lot of backlinks (it doesn’t) it could pull in traffic from a lot more phrases than the one (no traffic SERP) we’ve discussed above: Languagenut SEO Review isn’t a money SERP, a small number of Google users will search for Languagenut Review and the main article ranks highest for that phrase. What you should learn from this is if we create large articles it’s very easy to loose SEO focus, it’s not easy to target a large article at one short phrase without making that phrase harder to obtain via the content alone. Content is very important, but Content is King is a Myth, if I put a lot of effort into backlinks to the main article it would easily beat the comment page AND because there’s a lot of content, keyword spread could result in hundreds of SERPs that’s not possible on the shorter comment page webpage. Since I don’t plan to build a lot of links to this review, it would probably make sense to break this huge SEO review into a set of articles and target each webpage at different SERPs.